I have bike envy – major bike envy! Ever since we went to New York last month, and I saw the pretty powder blue Felt ZW6 in the Brooklyn bike shop, my Zing has been getting the cold shoulder; you’ve been great over the years, dear bike, but I have a new love now, and she’s just so darn pretty! Her sweet blue hues and carbon fibre goodness are filling my dreams, and pretty much my every waking moment too. How could she not, just look at her! And ever since finding my new love (don’t worry Mario, you’re still top of the list for human love!) it seems like everyone is getting fancy schmancy new bikes. My girlfriend Chelsey just got herself a new Bianchi (another love of mine!) and Mario literally just got off the phone with a friend of ours who bought himself a 100 per cent carbon fibre framed Cannondale. So jealous! 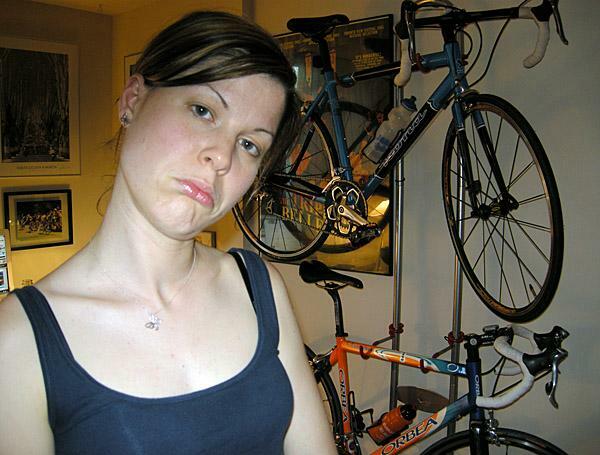 Can't catch a Contador on my Zing ... and yes, we do have a bike room! The run was good, a lot better than the night before, when at times I felt like I was sucking wind a bit. Probably helped that it was a recovery run … although we were still going about 20 seconds faster than we should have been at an average pace of 6:48. But, I’m sure once we get ourselves up to say 29k + 6k + 8 hills + 10k + 6k all in one week, we’ll have no problem keeping our pace down! What was/is your latest must have purchase? They had that bike at the store where I bought mine, it is a beauty! As soon as I saw her I told Mario I’d sell both my bikes just for one of her!